There are three types of ribbon ink: wax, wax/resin, and resin. Different types of hard and soft waxes are used in wax ribbons. They are generally used for short term applications where the image is not required to stand up to repeated scratching, contact with chemicals, or high temperatures. Wax ribbons can be printed on a wide range of labelstocks, but the most common and economical match is coated paper. Typical applications include compliance labelling, and shipping labels. Waxes and resins are mixed together to produce ribbons that show improved scratch and smear resistance, as well as improved solvent and heat resistance over wax ribbons. Wax/resin ribbons can be printed on a wide range of labelstocks, but are particularly good matches for coated papers and coated synthetics, such as Kimdura®. Typical applications include bin location labels, and labeling for horticultural and health care applications. Resin ribbons offer the highest degree of scratch resistance. They are also resistant to a wide range of solvents and can be used in applications in which very high temperatures are encountered. Resin ribbons are designed to adhere to pre-treated polyester, polyimide, polypropylene, and polyethylene labels. Typical applications include agency recognized labeling, circuit board labeling, and labeling of chemical drums. The ribbon unwind serves one primary function—hold the TTR roll in place while the thermal printer is running. TTRs are wrapped around cores that fit perfectly onto the ribbon unwind. Usually the ribbon unwind is located in front of the label unwind and both are pulled under the thermal printhead by the movement of the platen roller. The label unwind holds the roll of labels in place while the thermal printer is printing. The labels are placed on the label unwind and fed between the platen roller and printhead, along with the TTR. As the thermal printing process continues, the labels are pushed out of the printer by the force from the platen roller. After the TTR has been pulled through the platen roller and thermal printhead, it must be manually attached to the ribbon take-up spindle. The ribbon take-up spindle rotates in the opposite direction of the ribbon unwind to collect the TTR after it has passed through the thermal printing process. The ribbon take-up spindle allows for easy disposal of the used TTR. The ribbon sensor is an important component of the thermal transfer printer. It senses if a TTR is in place. This sensor also detects the end of a TTR roll by notifying the printer's internal computer when it has reached the trailer film. Not all thermal transfer printers use a ribbon sensor—some thermal printers use an end core sensor. Both sensors have similar functions—to detect the end of a TTR roll. Detecting the end of a TTR roll before it reaches the thermal printhead is important for protecting the thermal printhead. The end core sensor is located inside the ribbon unwind. Its primary function is to detect a lack of motion from the ribbon unwind. This process works closely with the TTR's end film and adhesion to the core. The end film of a TTR is loosely attached to the core. 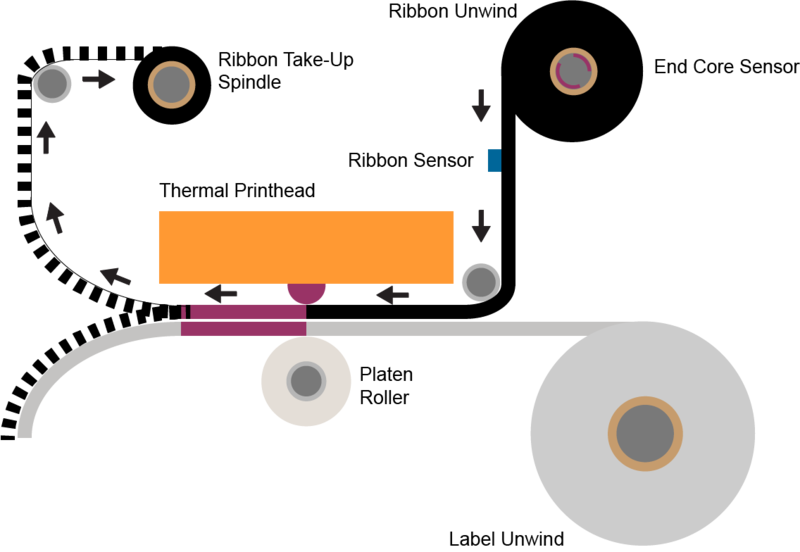 When the TTR reaches the end of its roll, the constant rotating motion will detach the end film from the core and the ribbon unwind will cease its rotations. The end core sensor will detect this lack of motion and notify the thermal printer's internal computer to stop printing. The thermal printhead is the most important mechanism of a thermal transfer printer. The thermal printhead consists of a fixed number of heating elements corresponding to the thermal printhead's printing resolution. Once fired, these heating elements transfer heat through the TTR and onto the label substrate. When combined with pressure, this completes the printing process by transferring the melted ink to the label substrate. The platen roller is usually a stationary roller centered directly under the thermal printhead and serves as a multi-functional component in the thermal printing process. A small motor spins the platen roller into motion. This motion guides the TTR and label through the thermal printer and, more importantly, under the thermal printhead for printing. The platen roller is also used to help feed the TTR and label into the thermal printer.